Construction of a giant Meccano style footbridge over a canal in Bolton is underway. The steelwork bridge has been designed by public artist Liam Curtin. The original walls and abutments for the canal bridge, at Nob End in Little Lever, have already been rebuilt and the construction of the metal work using scaled up Meccano style pieces in now underway. The bridge will be built on the site of an old disused horse bridge and it will stand 1.3m high and span 6.4m across the canal. The scheme is intended to create better links between Little Lever and Moses Gate Country Park. Artist Liam Curtin, members of the Manchester, Bolton and Bury Canal Society and local volunteers will be constructing the bridge. Work is expected to take a few days to complete and could be finished by Tuesday. The scheme is costing £90,000 and is being funded through an agreement with a developer as part of a local planning application. 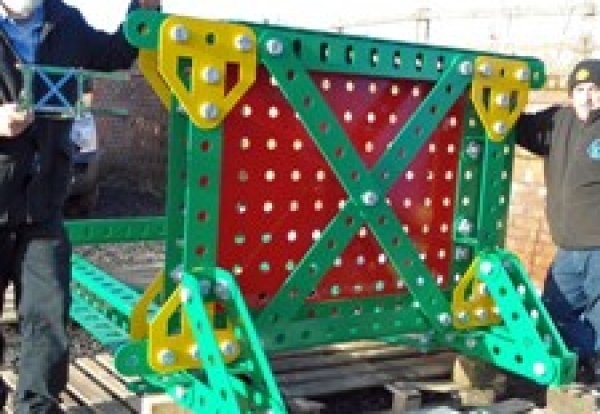 Curtin said: “Building a bridge from giant Meccano is the fulfillment of a childhood dream. “I spent my entire childhood building mechanical devices from Meccano and now we have the largest Meccano style set in the world. “This project is unique not just in the sense that it is scaled up Meccano but because local people are actually building their own footbridge and it is bringing the community together. “It wasn’t until I actually saw the finished pieces arriving from the factory that I realised we had created something quite wonderful. “As members of the canal society unpacked the lorry they appeared like Lilliputian figures in a magical toy world. “I am so grateful to everyone involved. “The engineers at Bolton Council have been creative and inventive and given us something which is structurally sound without compromising the artwork.